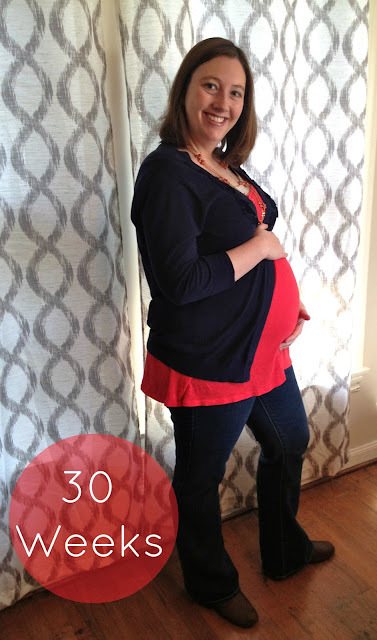 I can hardly believe that I'm at 30 weeks already! The first trimester was sooo slow, the second zoomed by, and now we've got about 10 weeks until D-day. I've been busy painting the furniture for the nursery, and once that's done, we can start putting it together. The nursery won't be fancy, but we're doing our best to make it special for baby. Like most things I do, I want to keep it simple, fresh, and cost-friendly :) I'm excited to show you the final reveal! Anyway, enough about the nursery! Want to see the 30 week bump? Baby stats: He's as big as a head of lettuce and just over 3lbs. Symptoms: Sore. I'm getting to point where I'm starting to feel more uncomfortable--like there is a baby inside! My belly isn't as squishy, so bending and even sitting is a little more tedious. I also get back pain if I sit or stand too long. But, I'm finding that yoga, walking, and a bath generally help a lot! Movement: Baby boy is moving--a lot! 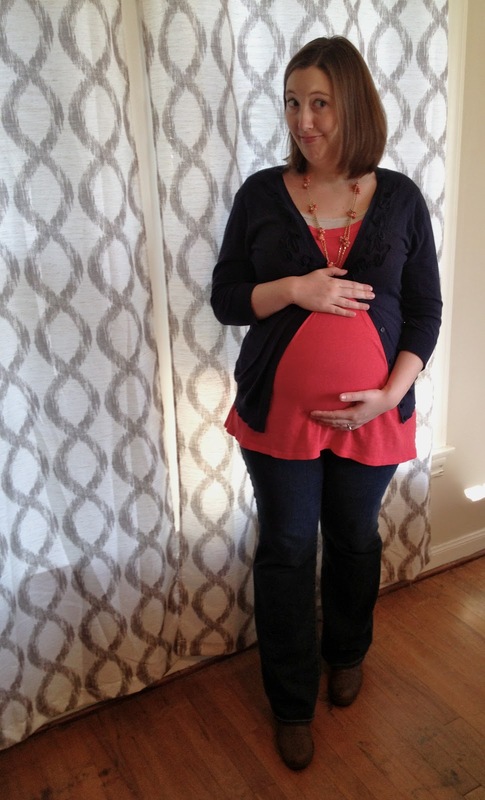 It's fun to watch my belly hop and jiggle and try and figure out what is kicking me. Sometimes I get a swift kick out of nowhere, and it scares me! Cravings: Does sleep count? I'm not craving any particular food, but I would like some more sleep. Exercise: I've been doing better at getting exercise (although lately I've been counting painting as exercise since a lot of squatting, bending, and arm movement is involved!). Yoga, walking, and a few prenatal pilates work-outs are my favorite. I always feel so good after a little exercise! What I miss: Sleep. I feel like I say that every time, but I really do miss a good, solid night of sleep! 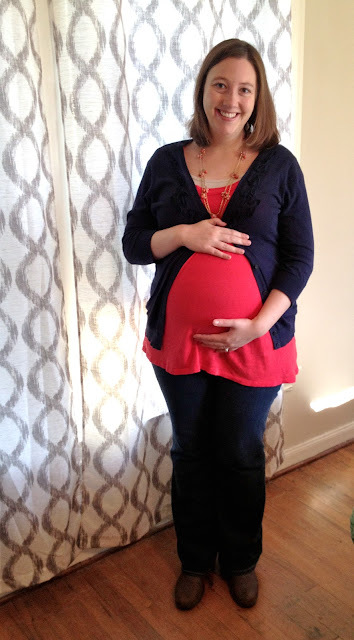 Yay for sharing maternity clothes. It is amazing how a few additions can make you feel like you have so many options when it comes to getting dressed! I finally went to Destination Maternity today and only bought PJ's but they're cute and I know I'll wear them even after baby comes! For your hair, maybe an a-line cut? It looks different, but without looking too short around the face. I've had one on and off for years, so I'm biased! You are cute just the way you are! I love the growing bump! You look healthy and happy! This is Sara Wallace, btw.